Just in time for Valentine’s Day, Amazon has released a fun infographic to coincide with its list of the most romantic cities in the country. The annual list, which contains some repeat accolades for some cities but some new names on the list, was based on sales of romance titles, relationship help titles, DVDs and music, and sexual wellness aides. Knoxville, Tennessee, tops the list again, while Boise, Idaho, was the least romantic city based on consumers’ purchasing. Along with the data from sales activity garnered over the course of the last year, Amazon’s editorial staffers brainstormed a map of the 50 greatest love stories, attributing at least one well-loved title per state based on the book’s setting. Several states had runner-up titles in addition to their top picks, based on support for the titles from the staff. Amazon’s picks include stories of love of all kinds, romance and familial or friendship love included. From John Irving’s Cider House Rules to Fannie Flagg’s Fried Green Tomatoes at the Whistlestop Cafe, the stories encompass so many of the tales that shape readers’ hearts and have defined the genre of great love stories. 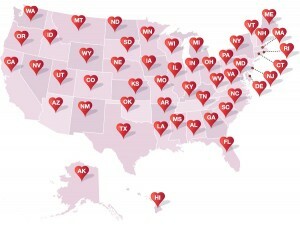 The complete list of beloved book titles by state is available at amazon.com/americanlovestories or by clicking HERE, along with the linked map to each book by its respective state. Amazon has also compiled a special list of treats for those readers looking for Valentine’s inspiration, available at amazon.com/valentines.